1SH ORIGINAL MOVIE POSTER 1978. PRINTER'S PROOF STYLE B. CONDITION: ROLLED UNUSED NM-MINT C9-C10. If it has any minor defects like pin holes, creases, etc. This is what all you. Fans have been waiting for! This is a genuine 28" x 41" U. One sheet ORIGINAL MOVIE POSTER PRINTER'S PROOF authorized by the studio to be printed when the film was released. Before a poster was printed in large quantities, the printer would print a limited number of test posters. Commonly, they would leave the color chart on the left edge of the poster, which added an extra inch to the width of the poster (which explains why the poster measures 28" x 41"). These would then be shown to people in a position to "OK" them. Once they were approved, the final posters would be printed and the proofs normally were destroyed. A printer's proof is far more rare than a regular one sheet poster, and there is no fear of purchasing a reproduction. These can be very difficult to find in any condition! A long time can go by without one of these coming up for sale. You will have trouble finding a nicer one. Straight from a former employee who used to work at Gore Graphics in the 1970's. Gore Graphics printed many of the posters for the National Screen Service. We have a few other proofs from this source, and some of them are one of a kind! This C9-C10 graded poster is virtually flawless! It may have 1 extremely minor imperfection. Our extra large photos generally speak for themselves. We do not always list every little defect. This is NOT a reprint or reproduction poster! It is a REAL ORIGINAL MOVIE POSTER PRINTER'S PROOF from when the film was released. These combined charges can add up to 25% or more to your final cost. For other European countries the charges will differ. Please check with your postal system on their procedure for packages from overseas so you are not unpleasantly surprised. You must notify us before sending it back. This is extremely rare, but it does occasionally happen. We know how to create a listing that will provide you with the highest dollar possible. We can yield for you MUCH MORE than you would get if you auctioned them yourself up to TEN TIMES or more! Let us sell your posters for you! For more information about CineMasterpieces please see. We guarantee that all posters we sell are graded and described accurately. Unless otherwise specified in the description, ALL POSTERS ARE ORIGINAL MOVIE POSTERS original theatrical movie posters that were displayed or meant for display (unused) in theaters at the time the movies were released. We will put in writing that we guarantee it to be an Original Movie Poster. 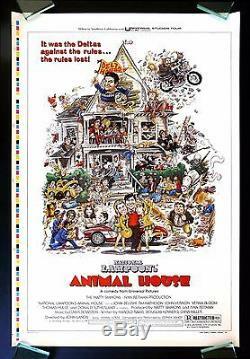 The item "ANIMAL HOUSE CineMasterpieces 1SH ORIGINAL MOVIE POSTER PRINTERS PROOF NM-M" is in sale since Sunday, April 27, 2008. This item is in the category "Entertainment Memorabilia\Movie Memorabilia\Posters\Originals-United States\1970-79".